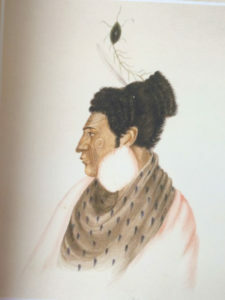 In 1843, Te Rangihaeata, a leading Ngāti Toa Rangatira chief, fortified this part of the Taupō settlement to live in during the land dispute tensions. In 1846, he moved to more easily defended locations and no fighting took place here. Te Rangihaeata was a prominent chief of the Ngāti Toa Rangatira iwi. In 1843, believing that Governor Grey was seeking his capture, he left his Mana Island kāinga and built a strongly palisaded pā here at Taupō. It is shown on British maps of the time as ‘Te Rangihaeata’s pah’. Recent writings have named Te Rangihaeata’s pā as Turi Karewa. However, there is no solid evidence of this name from that time. Moreover, knowledge of Māori culture, Ngāti Toa Rangatira history and hapū relationships, together with relatively contemporary documents (for example, Motuhara Native Land Grant 1874) clearly indicate this inference to be mistaken. Turi Kawera (not Turi Karewa) was, in fact, the name Māori gave to the nearby boundary division between the Taupō and Motuhara land blocks. This boundary is further north, around the shoreline from the site of Te Rangihaeata’s pā. Te Rangihaeata’s move was, presumably, partly to closely support his uncle, the Ngāti Toa Rangatira leader Te Rauparaha, who was well established at Taupō. The hereditary chief Te Hiko o Te Rangi and other Ngāti Toa Rangatira chiefs were also located at Taupō where they probably had their own clusters of whare too. Several European writers and painters of the time recorded the pā. 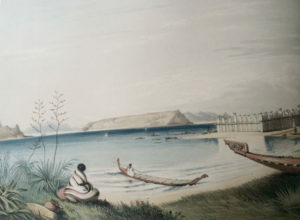 These images depict it with extremely large palisades extending from the edge of the exposed rocky shore (the point where the Fire Station stands today) back to the bluff behind, where the wāhi tapu was located. The present day small urupā is all that remains of the wāhi tapu. Contemporary illustrations show a semi in-ground wharepuni (sleeping house), an elevated pātaka and the interior of a house with carved ridgepoles, all indicating a substantial settlement. The whare were made of thatched nikau and tī kōuka (cabbage tree) leaves. The strategic positioning of the pā afforded a commanding view over the entrance to the inner harbours and coastline, and control of the start of the most important route north, the Taua Tapu track. All who travelled the track could be watched and, if necessary, questioned. Te Rangihaeata remained here until early 1846 when he abandoned the pā as the arrival of troop ships made it vulnerable to attack. In June 1846, he built a new pā, Matai-taua, at Pauatahanui (the site of the present-day St Alban’s Church) which was protected from a sea attack by mudflats. 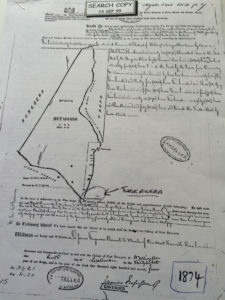 Native Land Grant records, Motuhara, 10 September 1874.